Benefits from Shaykh ʿAlī al-Ḥaddādī on War Captives in the Islāmic Sharīʿah. War is a means by which one set of (transgressing) people are checked by another, and without it great corruption would spread through the Earth. In Islam there are detailed injunctions for conducting war in the most just and humane way. 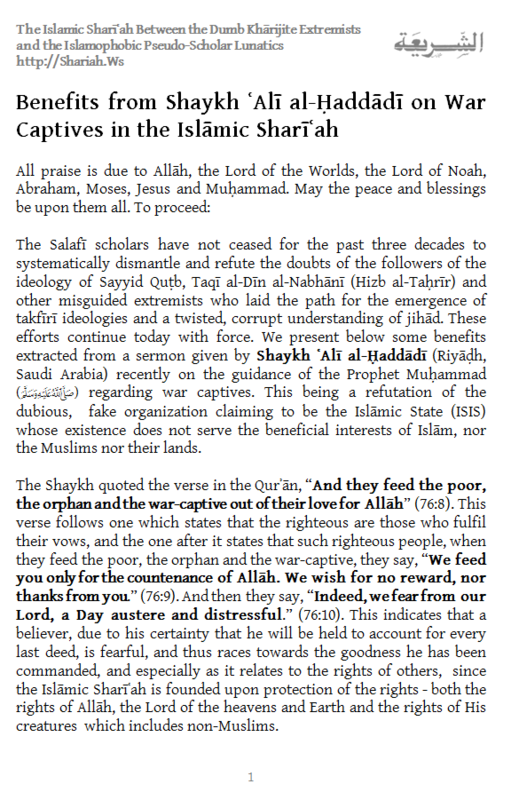 We present below some benefits extracted from a sermon given by Shaykh ʿAlī al-Ḥaddādī (Riyāḍh, Saudi Arabia) recently on the guidance of the Prophet Muḥammad (sallallaahu alayhi wasallam) regarding war captives. This being a refutation of the dubious, fake organization claiming to be the Islāmic State (ISIS) whose existence does not serve the beneficial interests of Islām, nor the Muslims nor their lands. Download Full PDF Document.